various shopping articles known for their unique charm. jewellery which is a speciality of Rajasthan, alluring miniature paintings, leather goods, lovely brass utensils, mesmerising puppets and pottery. Pushkar is considered to be one of the most interesting places in Rajasthan to buy costume jewellery and embroidered clothes. 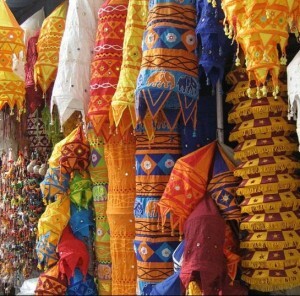 One can purchase various items like beads, brass utensils, lovely colourful bangles, leather goods, unique embroidered clothes, camel cover, and much more at the time of Pushkar Fair. Major shopping areas in Pushkar are Sarafa Bazar, Baza Bazar and Kedalganj bazaar.